← Greek elections 2015: the beginning of the end or the end of the beginning? About ten days have passed since the new Greek government came into power and also the spotlight of the international media over its negotiations with European partners concerning the country’s debt. Negotiations aside, however, there is a person that attracted the greatest part of media attention over the last week, namely the Greek Finance Minister, Yanis Varoufakis. This attention has been unprecedented compared to the many Finance Ministers Greece has changed over the last few years, not only in terms of its amount but also its nature. Dressed in casual clothes, untucked shirts and sporty jackets, Varoufakis made it to the fashion pages of major media outlets, and has been described as a ‘rock star’, ‘fashion trailblazer’, or ‘the most interesting man in Europe’. 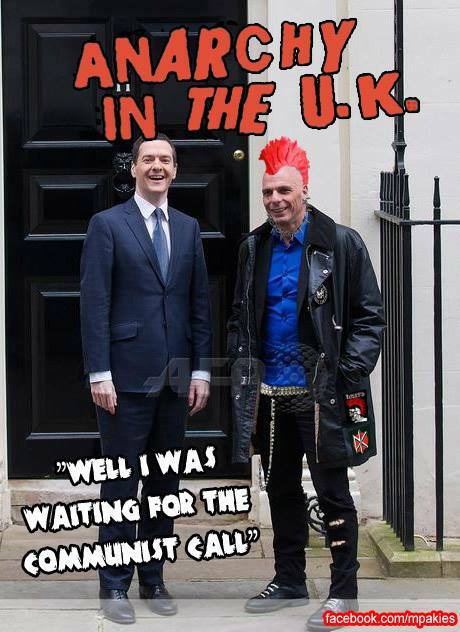 Meme circulated in social media, after Varoufakis’s meeting with George Osborne on the 2nd of February. Such coverage has been met with approval, humour, but also a lot of raised eyebrows and rolled eyes, especially among the unconvinced in Greece, for whom Varoufakis and the discussion on the new government’s styling options – the Prime Minister, Alexis Tsipras, refuses to wear a tie – illustrates the humiliating downfall of Greek politics and the incapacity of the Syriza government to assess the seriousness of the situation the country finds itself in. There are, though, two fallacies in such a position. On the one hand, it displaces blame, as it is the media not the Greek government itself that talks about stylistic choices on top of – and not instead of – political negotiations. Second, by describing the choice of casual style as a way of trivialising politics, these voices of disapproval actually recognise what they wish to defy in the first place: that clothes are important signifiers in politics. It is exactly for this significance of style in terms of visual communication that the media have been obsessing over Varoufakis in the last week. News media have a preference for simple messages that can be easily communicated to their audiences, while also attracting their attention. In that respect, Varoufakis’s stylistic choices are not only a novelty but also a compelling visual symbol of the politics of Syriza. It signifies the government’s attempt to stick to its pre-election agenda and do politics their own way without conforming to the rules that have already been set-up for them. This is an important message in the Greek national context, where it was assumed that Syriza might prove to be not very different from previous governments once in power. This can explain the Greek media focus on the fact that Varoufakis arrived in the Parliament on his motorcycle the first day of his new duties or that he flies coach. For the international media, Varoufakis provides a simple signifier for the politics of a party that they had so far framed as a threat to the stability of the Eurozone but does not so far appear to be so. As they are now trying to listen more carefully to the alternative political voice of Syriza and figure out a way of incorporating it to the media narrative of the crisis, Varoufakis’s appearances provide them with a strong but simple visual symbol. This symbol also challenges hegemonic understandings of who politicians are and what they look like. What traditional ideas of suits and ties as signifiers of seriousness and intellectual gravity hide is the ideological message that politicians are a different class from the public; that in order for someone to be taken seriously, they need to look different from everyday people; that, in other words, everyday people cannot be taken seriously. Varoufakis’s clothes and style defy this idea and signify an alternative way of doing politics. As such a populist symbol, therefore, Varoufakis has become a favourite for the international press and cameras. Connecting with the public is something at which Varoufakis is no novice, as he has already been a public academic before his election, blogging, tweeting, and often engaging with his readers and followers in a dialogue. 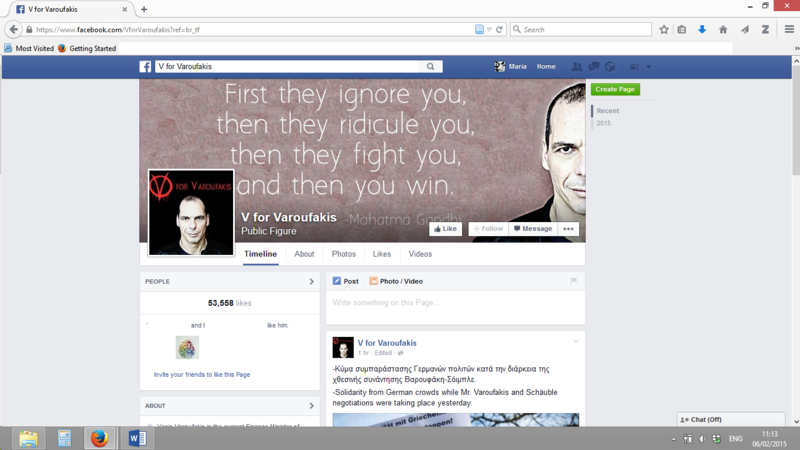 The Facebook page ‘V for Varoufakis’. There is then a further dimension of Varoufakis’s ‘rock star’ appearance, which goes beyond his coverage by the media. His electoral win was based on a large group of supporters, who got to know him through his previous engagement with the media, both mainstream and alternative. This group consists to a large extent by young people, a segment of the population hitherto disengaged from politics. His recent appearances as a Finance Minister not only have not disappointed his supporters but on the contrary have confirmed their hopes that he is a different kind of politician and Syriza will be a different kind of government that will signify a break from the country’s politics of corruption and clientelism. Every appearance and talk of the new Finance Minister is followed by a parade of comments, memes, and broader discussions on social media. 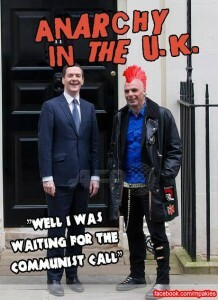 Some are solely on style; others engage with the politics. But what is certain is that never before has a Finance Minister’s voice been heard so loudly among the youth. For this young generation, Varoufakis has therefore become their voice and symbol of change. The debate on the personalisation of politics, namely the tendency of the media to focus on political leaders and their personal characteristics rather than the politics they represent has preoccupied political communication for some time now. The risk of such a tendency is of course that the content of the politics is ignored when the focus is on personal appearances. On the other hand, though, such a criticism tends to suggest that there is a clear-cut distinction between politics and performance or rational discourse and emotional response to politicians as individuals. Varoufakis has so far managed to combine a clearly articulated political discourse, which brought him to government, with a strong emotional appeal through his latest appearances. With only ten days under the flashlights, however, and a series of hard negotiations in front of him, how his popularity will evolve and whether his love affair with the media will continue is an open question. Maria Kyriakidou is a Lecturer in Cultural Politics, Communications and Media at the University of East Anglia. Her work focuses on the mediation of distant suffering, the role of representation in globalisation, cosmopolitanism and discourse theory. She is also interested in the way media discourses on the Euro Crisis construct and reproduce national stereotypes and divisive lines among the European counterparts. She holds a PhD in Media and Communications from the LSE. This entry was posted in Greece, Maria Kyriakidou, Uncategorized and tagged Greek economy, populism, SYRIZA. Bookmark the permalink.